For many years now, I’ve tried to grow mint in my flower-beds-slash-garden, key word here being “tried”. For some odd reason, I was never successful. Still, I always followed the recommendations and never dared planting it DIRECTLY in my flower beds. Rather, I kept it contained in its own little planter, next to various other less-invasive fine herbs and leafy greens. If the stuff is as easy to grow as they say, surely I’d have no problem getting it to grow in there, right? 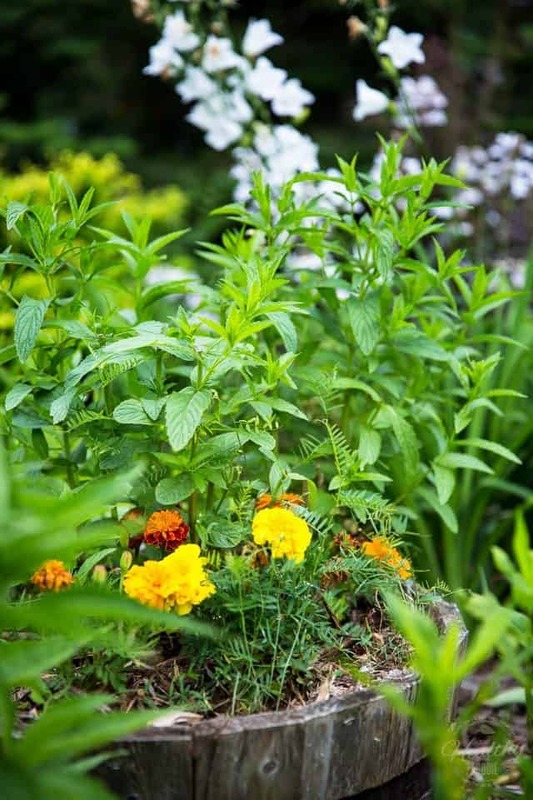 I’ve got oregano galore and chives can be found are all over the place… But my mint just keeps dying consistently, year after year after year. Well, I’m not gonna complain and am totally planning on making the best of this situation! You should’ve seen the look on my face when I proudly walked to my planter, scissors in hand, to collect me some mint leaves to make those beautiful lamb kabobs! I practically strutted all the way there! And just look at how beautiful these lamb kabobs turned out to be! Even in their raw state, they look so good you almost want to eat them right away! But it’s probably best to wait until they’re grilled before you do that. While the mint leaves will loose their beautiful vivid green color, they will still taste amazingly good with those chunks of grilled lamb meat. Because yes, in case you’re wondering, you’re actually supposed to eat the mint leaves together with the meat. The combination of flavor is totally out of this world, especially when you add a little bit of the tahini dipping sauce to the equation. Just wait ’til you get a taste of them, you’ll know exactly what I’m talking about. 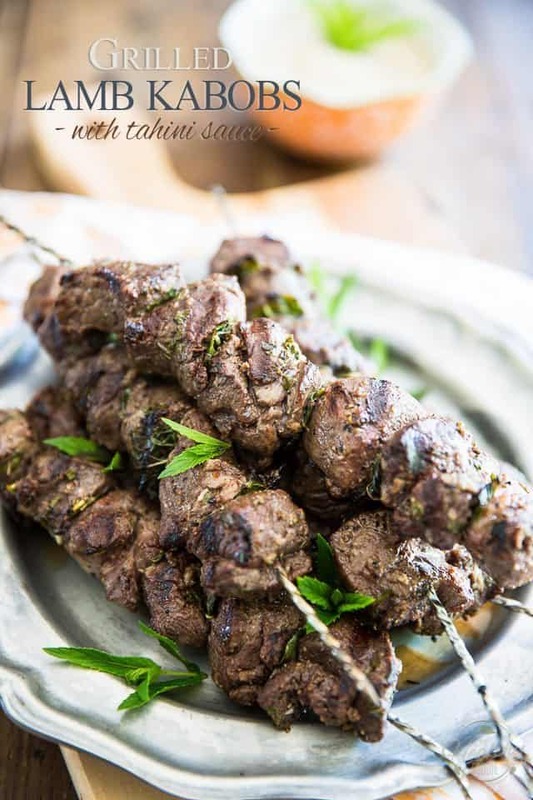 These kabobs have such as unique and complex flavor profile, they are totally worthy of a 5 star restaurant. 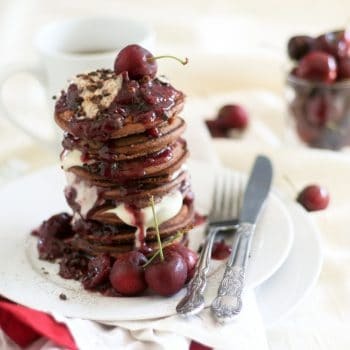 Except you get to make them super quickly and easily in the comfort of your own home! And perhaps even with your very own mint! 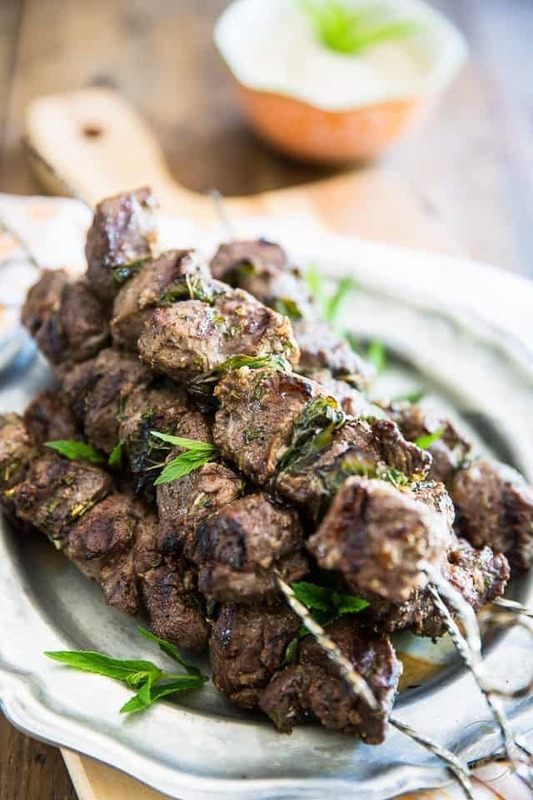 Obviously, the main thing that you will need to replicate these amazing kabobs at home is a bunch of beautiful cubes of fresh lamb meat. You can very easily cut your own out of a boneless leg of lamb. To do that, simply trim as much of the visible fat from the meat as you can, and then cut out 36 cubes of roughly 2-inches each. You will require about 2 pounds of meat to do that. 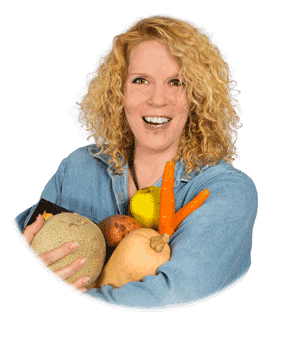 Of course, you could also get the butcher to take care of the cutting and trimming for you, or look for pre-cut cubes in the meat counter. 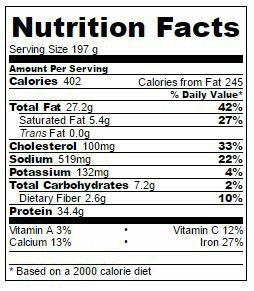 Also, note that I chose to use the meat from a boneless leg of lamb to make my kabobs, but a boneless shoulder would work just as well! 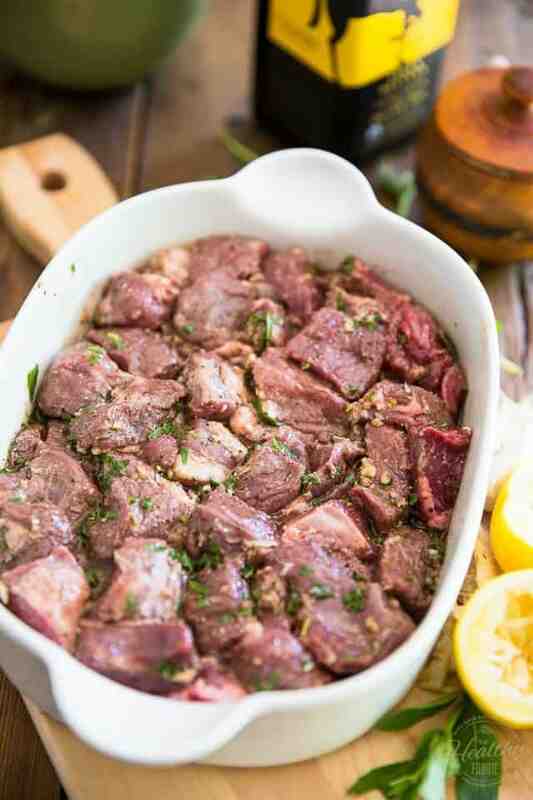 Once you’ve got the meat taken care of, it’s time to make a marinade for it. 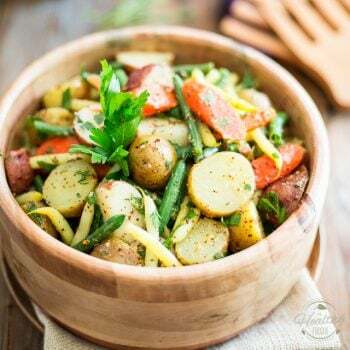 In a large bowl or measuring cup, place the minced garlic, lemon juice, chopped mint, salt, pepper, allspice, cinnamon and extra-virgin olive oil. 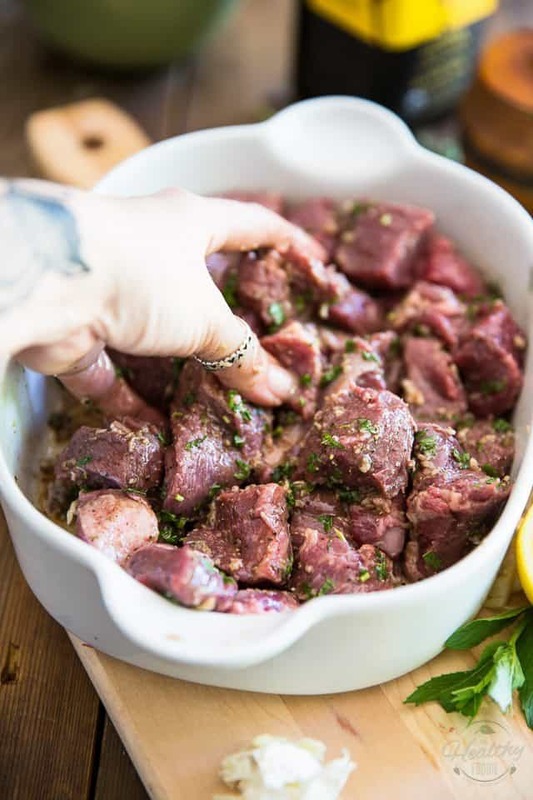 Place your meat in a non-reactive container and pour the marinade over it. 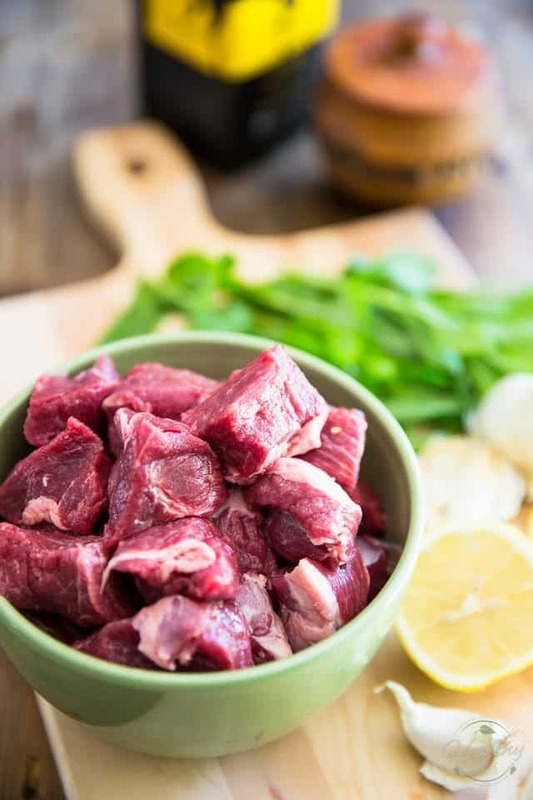 Massage the marinade into the meat with your (clean!) fingers, making sure that every single piece gets completely coated. Then, arrange the meat in a single layer, cover it with plastic film and refrigerate for at least 4 hours or up to, and preferably, overnight. Now let’s work on that tahini dipping sauce. 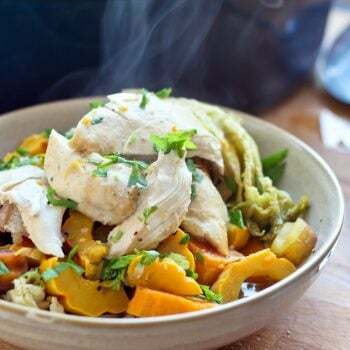 To make it, simply combine all the ingredients together in a mixing bowl and stir until smooth and creamy. This sauce you can choose to make right away or wait until just before you are ready to put the kabobs on the grill. The main advantage of making it ahead of time is that the flavors will get a chance to meld and develop a little. Honestly, though, this sauce is so crazy tasty that giving it time to rest is not really necessary. Ultimately, the choice is yours: do what’s more convenient for you. If you’re gonna make it ahead of time, just make sure you keep it refrigerated until ready to serve. When you are ready to eat, lightly oil the grate of your outdoor grill and then preheat it to very high heat, like 550°F – 600°F. 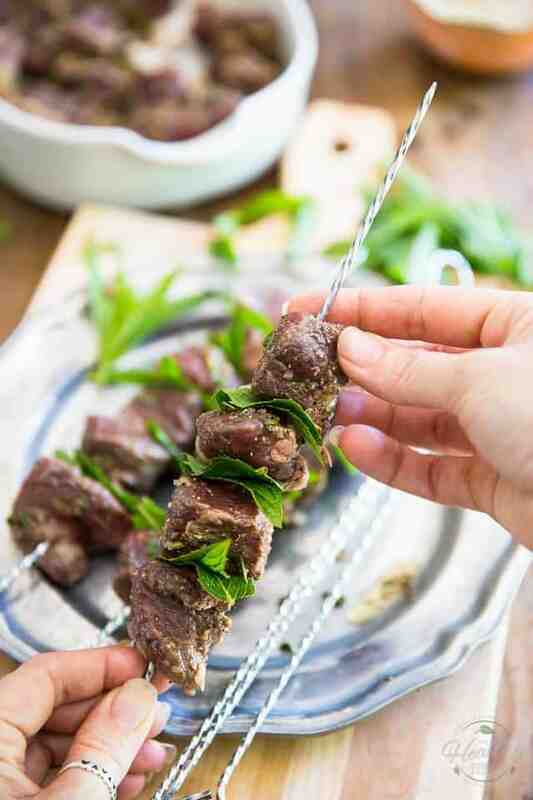 While the grill is heating, thread the lamb meat onto skewers, using 6 cubes per skewer and placing one large fresh mint leaf between each piece of meat. 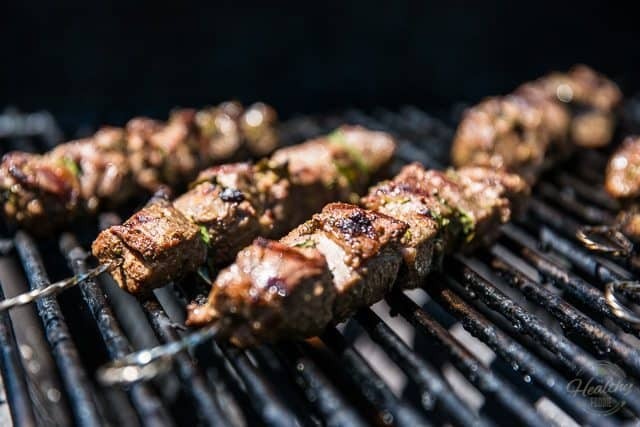 Once your grill is nice and hot, place the kabobs on the grate, lower the heat to medium-high, close the lid and let the skewers cook undisturbed for about 2 to 3 minutes then flip them over and continue grilling for another 2 to 3 minutes for medium-rare. 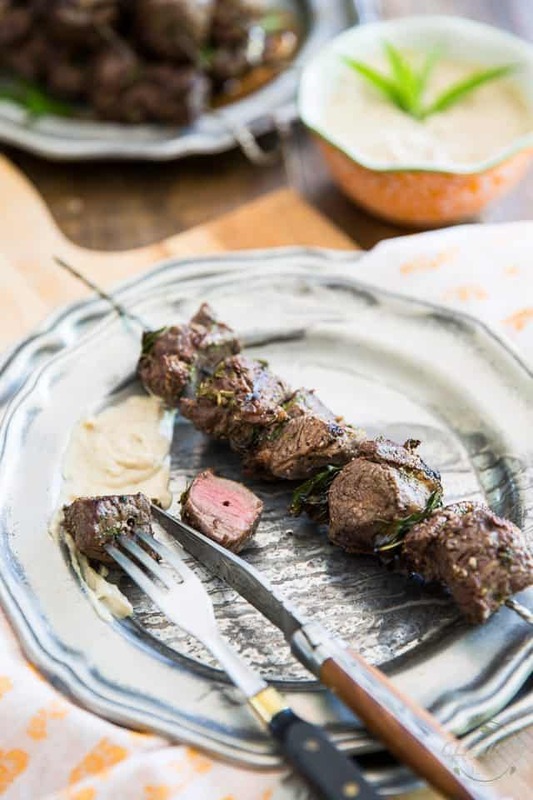 I don’t really recommend cooking lamb past medium-rare, but if you prefer your meat a little bit more well done, feel leave the kabobs on the grill for an extra minute or two…. 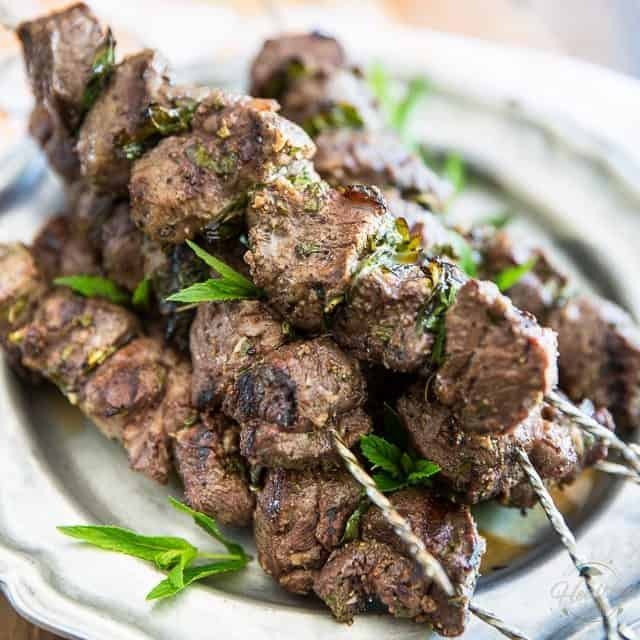 When the kabobs are fully cooked, remove them from the grill, cover them loosely with foil and let them rest for about 2 minutes before serving. 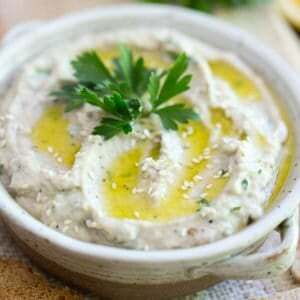 Oh, and don’t forget the tahini sauce! It just goes so absolutely brilliantly with the meat! Trim all visible fat from the meat and cut it into 36 cubes of roughly 2-inches. 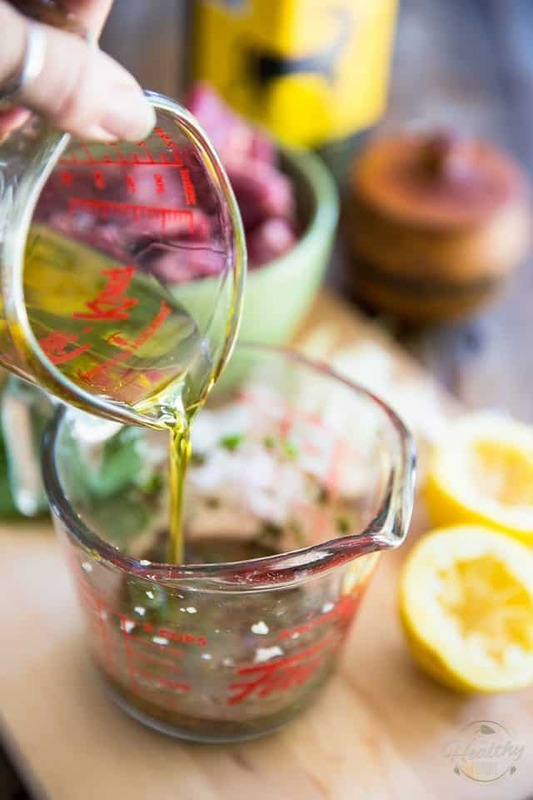 In a large bowl or measuring cup, place all the ingredients for the marinade and stir until well combined. 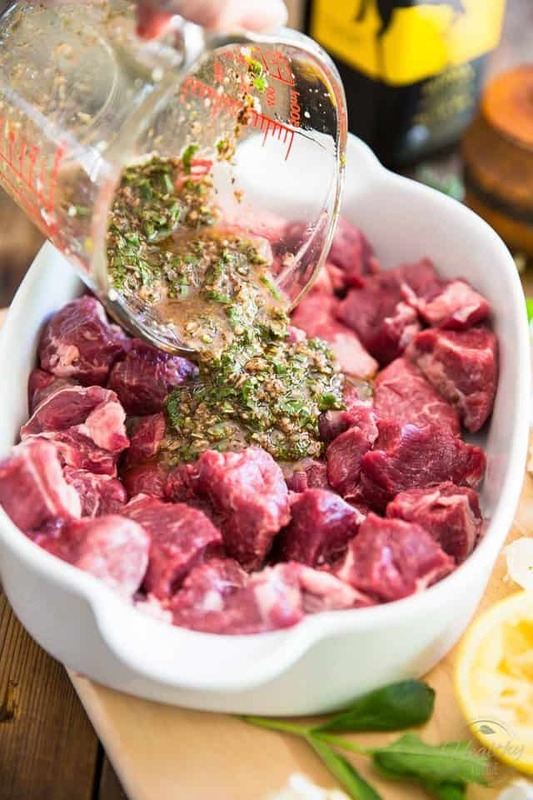 Place your meat in a non-reactive container and pour the marinade over it. Massage it into the meat with your fingers, making sure that all the pieces are well coated. Arrange the meat in a single layer, cover with plastic film and refrigerate for at least 4 hours, or preferably overnight. 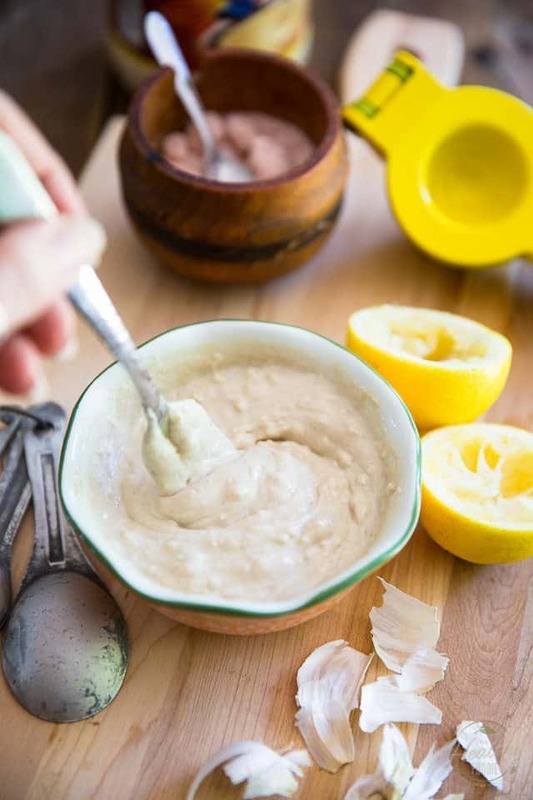 Make the tahini sauce: combine all the ingredients together in a mixing bowl and stir until smooth and creamy. Keep refrigerated until ready to serve. 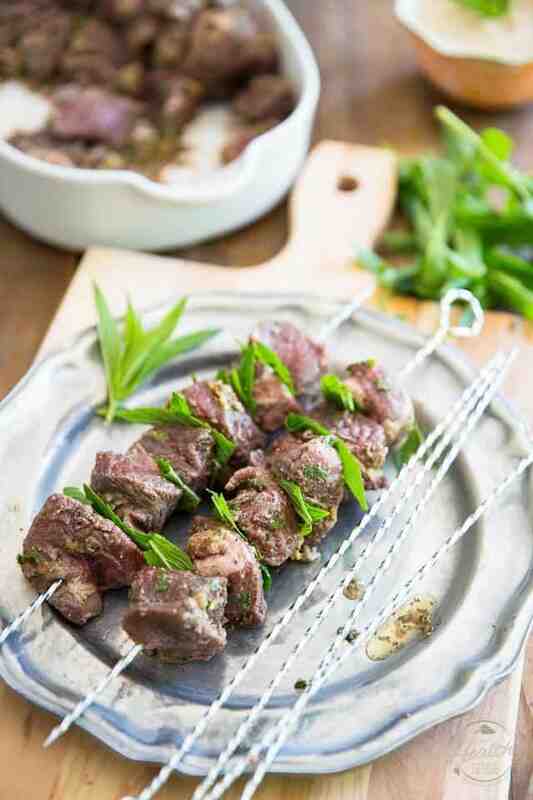 While the grill is heating, thread the lamb meat onto skewers, placing 1 fresh mint leaf between each piece of meat. Place the kabobs on the hot grill, lower the heat to medium-high, close the lid and let the skewers cook for about 2-3 minutes then flip them over and continue cooking for another 2 to 3 minutes for medium rare. 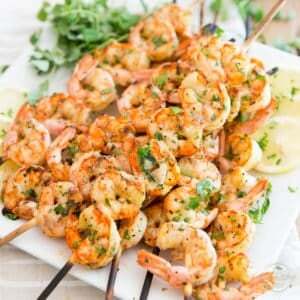 Remove the kabobs from the grill, cover loosely with foil and let them rest for 2 minutes before serving. 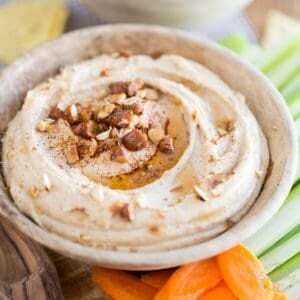 Serve with the tahini sauce. I really love lamb its my favorite meat. 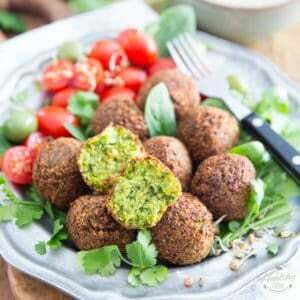 Never tried it kabob style though with tahini sauce, looks tasty. 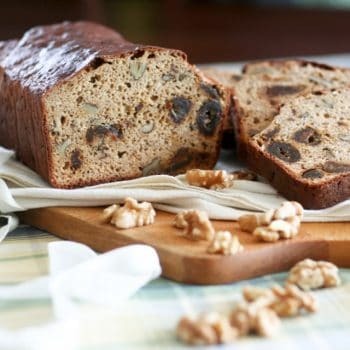 Thanks for the recipe!!!! Tried this for dinner tonight with the lamb I got from my CSA share and the mint growing in my backyard. This was so good, and I really liked the tahini sauce too ??? ?